Home›Reviews›Lita Ford - Her Long Awaited Autobiography! 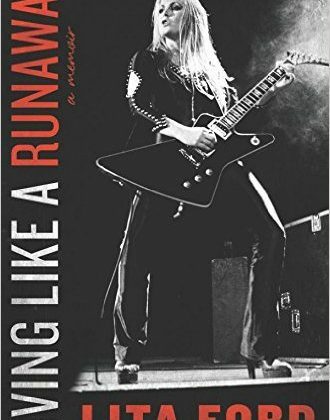 Living Like a Runaway is the long-awaited autobiography from Lita Ford, who has made a name for herself over the years in the music industry, both as a member of The Runaways back in her teens, and as an acclaimed solo artist in the 1980s. More recently, after a long exile, she has made something of a return to the music business, thus making this book a welcomed addition to the collections of fans. Following a foreword by Dee Snider, Living Like a Runaway wastes no time going into the details of Ford’s life, from her early years and discovery of music to being thrust into the spotlight overnight as a teen rock sensation in The Runaways, alongside such names as Joan Jett. The book then goes on to explore her rise to solo fame and the creation of her biggest hits, as well as ill-fated romances with some of rock’s biggest names. Even her latter years are explored, including battles behind the scenes and her withdrawal from the music business and subsequent return following a horrendous marriage. Anyone who knows me knows I am a huge rock and metal fan, as well as a huge Lita Ford fan. That said, I was all the more eager and interested to get my hands on her autobiography upon its release. While there are a few minor issues here and there, overall it is a good read, and it should not disappoint fans. Ford scores major points for talking about everything from her encounters with famous rockers and her relationships with them here, to fare like her day-to-day life and thoughts on family and friends who maybe were not the most prominent people in the industry. It is good to see that her approach to writing this book acknowledges so many people, including those "behind the scenes." You really do get the idea here of the struggle a woman faced in what was largely considered a man’s world, and the developments and struggles throughout her career, as chronicled in this book, definitely do her justice. The latter few chapters, regarding her divorce from her husband, and the subsequent struggles in trying to reconnect with her children, are particularly heartbreaking and dramatic. The minor issues I had with the book stem from an overemphasis on Ford’s relationships and sexual conquests in a number of places in the books, and the fact that some of the latter parts of the book felt a little rushed and lacked the fleshing out they needed, namely this – how did Ford survive financially following the fall from grace she and so many others endured in the early 90s? There is a footnote in the book stating Ford opted not to “talk negatively” about her ex-husband Jim Gillette out of respect for her kids, so that may have something to do with this. Still, the good outweighs the bad. Living Like a Runaway is a not a perfect book, but the end result is a revealing and powerful life story that needs to be heard. Fans of Lita Ford should not pass her book by.